Custom header displays your company logo with multiple color choices. (2) Molded plastic carrying cases protect display when not in use. (2) 200 watt halogen lamps illuminate specific areas of the board. This portable exhibition booth stands 92" tall and 10' wide. The exhibit booth is covered with long lasting hook and loop receptive carpeting. 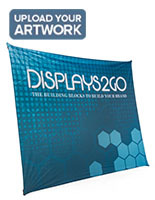 The fabric on the portable exhibition booth is perfect for hook and loop attachments. The fabric helps make a lasting impression for customers. 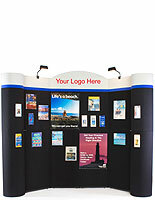 This portable trade show display features is customizable with posters and literature pockets. 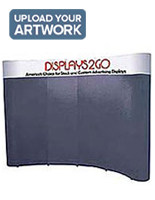 These advertising accessories easily attach with hook and loop on the booth. 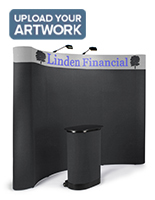 This portable exhibition booth can be set up in minutes! The exhibit booth includes two hard plastic rolling storage/travel cases. 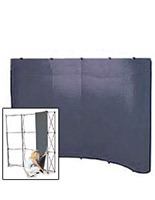 These cases protect the portable trade show display from theft with locks. Sick of the wrinkled graphics on cheap "pop-up" exhibit booths? 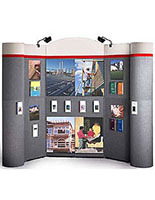 This sturdy portable exhibition booth is assembled from four pieces. Important graphics can lay perfectly flat. 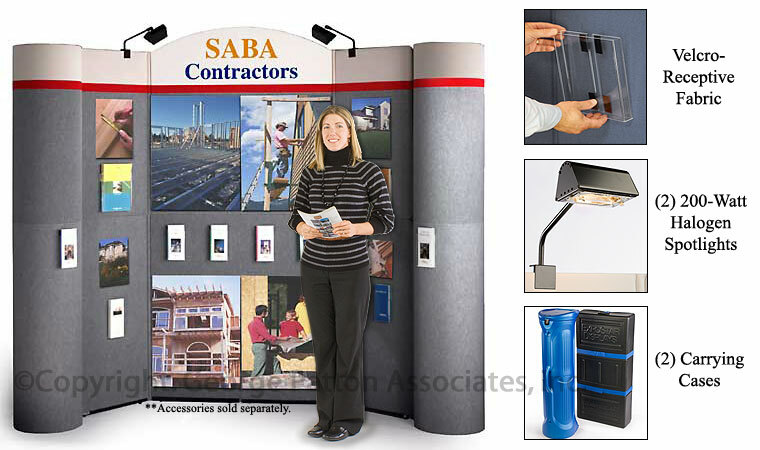 This portable trade show display package also includes two 200 watt halogen lights with 10ft power cords. The halogen lights are bright enough to provide an attractive spotlight on images. Operatiors can use the lights to focus on the most important advertisements on the portable exhibition booth. For text only headers please specify text in the "Special Notes" section of our order form. As a bonus the center section of this trade show booth can be used separately as a tabletop presentation board. Get more use out of your investment by using the center section for sales calls and small exhibits. Don't forget to add hook and loop attaching accessories to your order. 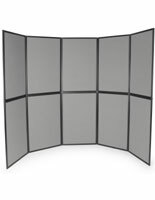 These include sign frames, brochure holders and hook and loop brand strip that make it easy to customize your tabletop display board.